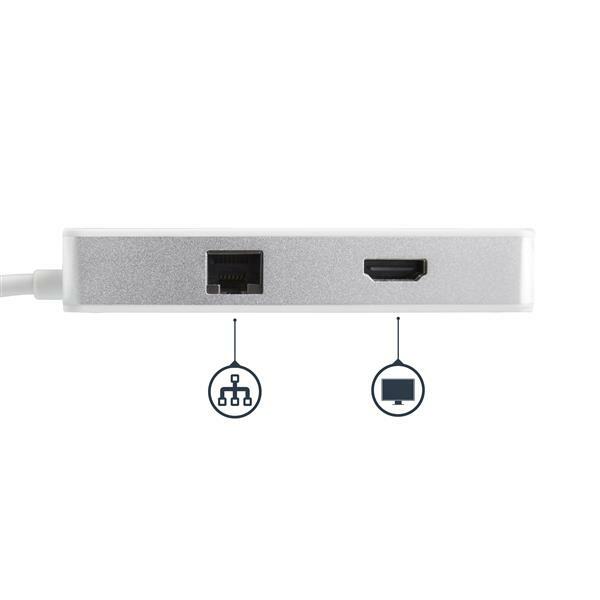 Expand the connectivity of your Thunderbolt™ 3/USB-C™ port enabled laptop. 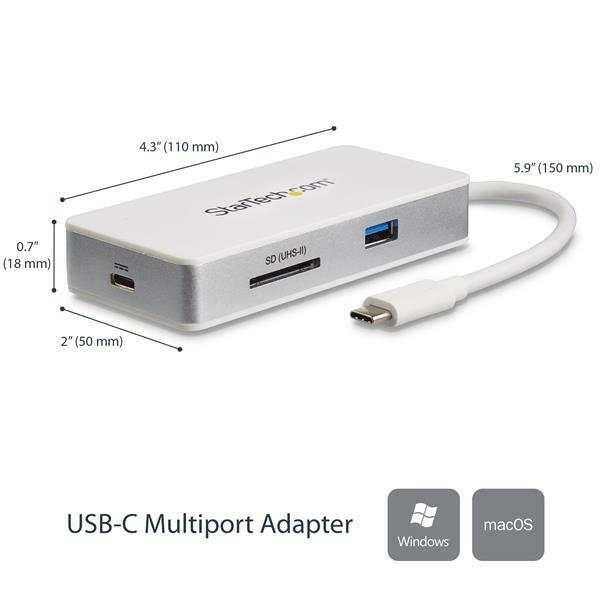 Compatible with Mac and Windows, this universal USB-C multiport adapter lets you turn your laptop into a powerful workstation, anywhere you go. 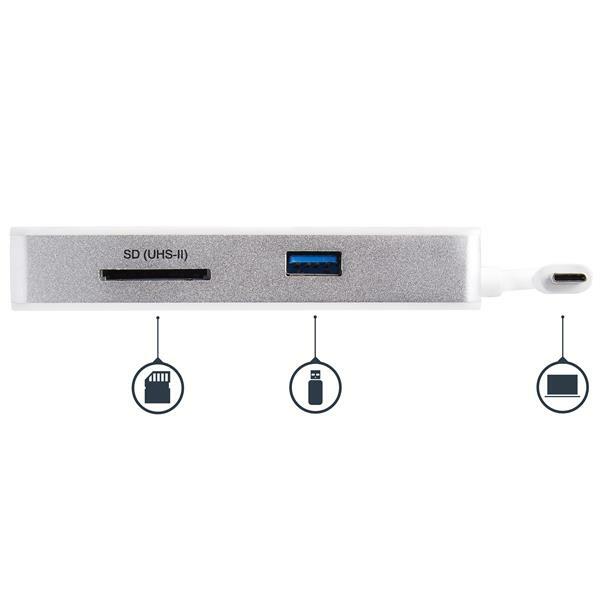 The USB-C adapter provides a 4K Ultra HD HDMI® video output, an ultra high-speed SD™ 4.0 card reader (with UHS-II support), a USB 3.0 Type-A port and one Gigabit Ethernet port, through your laptop’s USB-C port. 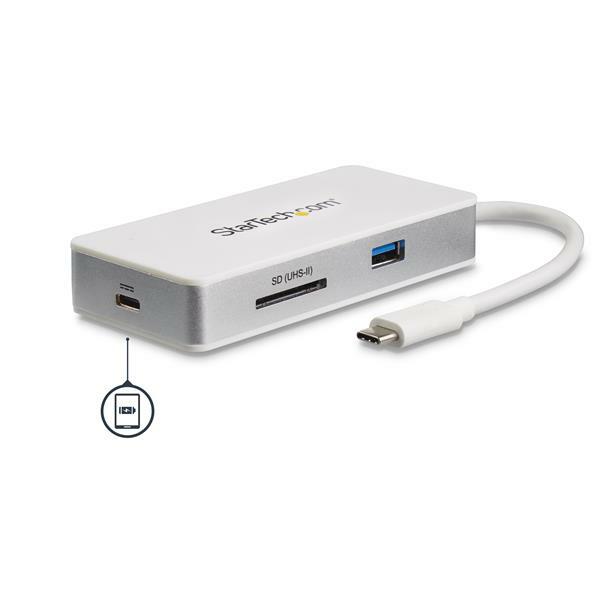 The adapter provides up to 100W charging power with USB Power Delivery 2.0, so you can power the adapter and your laptop at the same time using a USB Type-C™ power adapter. 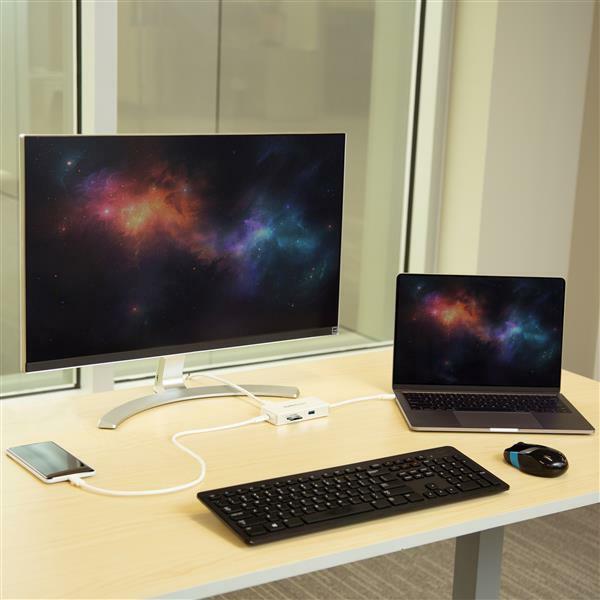 The USB-C multiport adapter offers a 4K Ultra HD HDMI port (with audio), so you can easily connect a high-resolution monitor (4096 x 2160p @ 24Hz or 3840 x 2160p @ 30Hz). 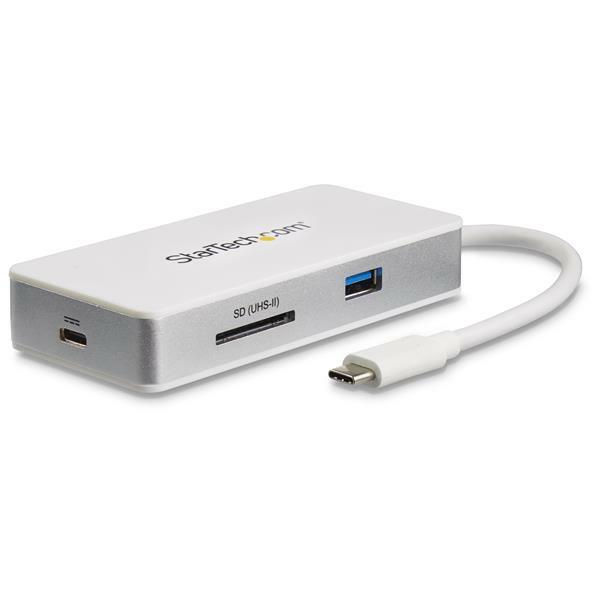 The USB-C multiport adapter features a memory card slot, providing fast read and write access for SD and microSD™ (with adapter) memory cards through USB 3.0. The card reader offers SD 4.0 and UHS-II support, allowing high-speed file transfers at up to 312MB/s. It’s ideal for transferring photos or videos from your SD cards to your USB-C enabled laptop or tablet. 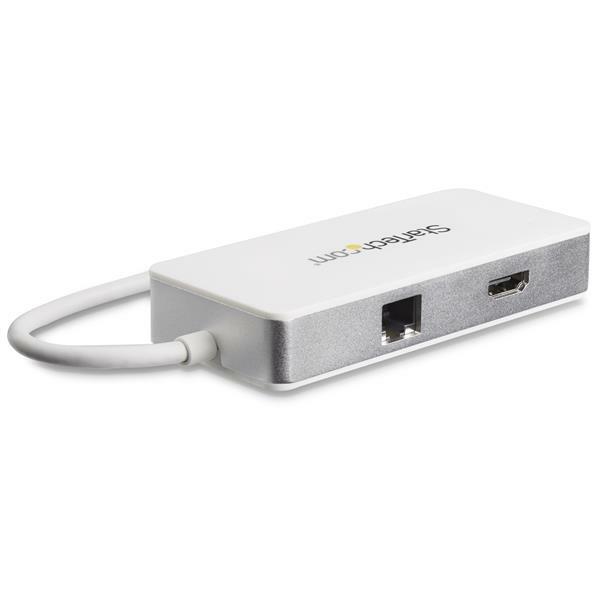 The Gigabit Ethernet port on the multiport adapter ensures reliable wired network access. Plus, an additional USB 3.0 port (USB Type-A) lets you connect a peripheral device like your mouse or flash drive. 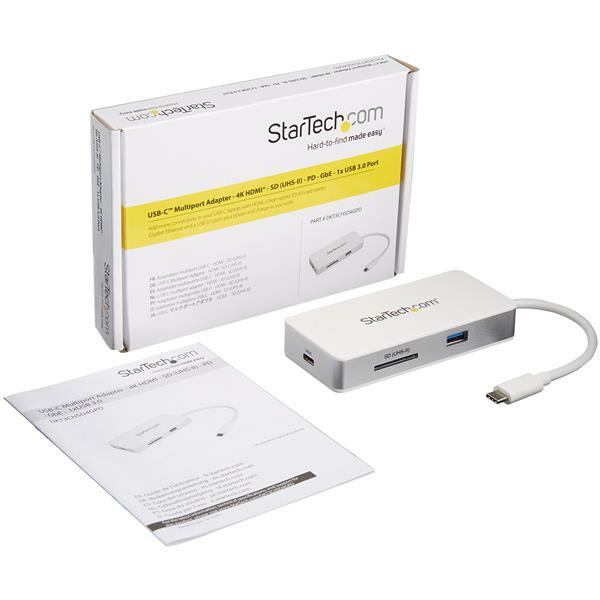 The DKT3CHSD4GPD is backed by a StarTech.com 3-year warranty and free lifetime technical support. Why am I having issues transferring files from an attached storage device using this adapter? If you disconnect a USB-C power adapter from the multiport adapter while transferring files to or from an attached storage device, it will stop the transfer and may cause file corruption. It is also possible that there will be a loss of function if the power adapter is removed from the adapter while it is in operation. It is important to always follow the disconnection steps listed below. Complete all data transfers over USB to and from the SD card. Disconnect the adapter from the host laptop. Disconnect your laptop’s power adapter from the adapter. Disconnect the HDMI connector, eject SD card and disconnect any USB peripherals as required.